Mechanism: every unique cod corresponds a letter: G, R, I, J or A.
Prizes: with a letter registered in the promotion a participant can win a daily prize of 100 Euro or a weekly prize of 500 Euro. Only by subscribing codes and forming the GRIJA word the participants could win one of the 3 monthly prizes of 10 000 Euro each! Channels of registration: The first promotional campaign in Romania which has 4 channels of registration: SMS, Web, Info-line and Facebook. Activation-conclusion: By creating a so called privilege, you establish a brand-consumer connection. 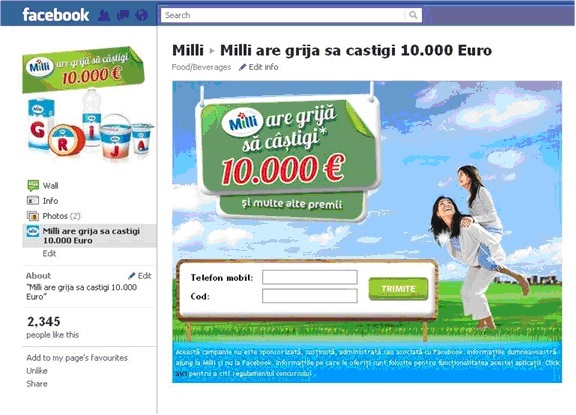 Milli build it’s database in 2010 at the first brand promotion, and used it having very good results and continues to increase it. Conclusions: segmentation of the database and the well chosen target brought a record response rate!